Alexander McQueen’s legacy will live on and continue to flourish throughout time. His work is timeless and years from now people will still mention him as a legend of fashion, a visionary, a man whose designs had no limitations. He is definitely one of my favorite designers so it was awesome to find many of his pieces on Farfetch.com. FF is a website where you can shop from the best boutiques all over the world. It brings them all together in one place to make your shopping easier and sometimes even cheaper! I came across Farfetch a few months ago and have been hooked ever since, as it has many designer handbags I love love love. 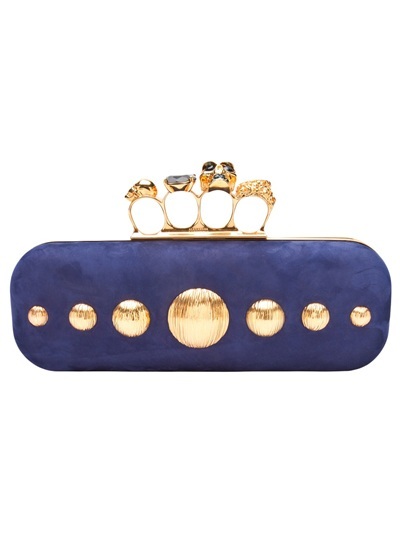 At FF you will find many including one of my favorites; the Alexander McQueen stud knuckle clutch. They have them in different colors and textiles. FF also has some McQueen apparel too along with shoes! How could I forget the shoes! I wish I could have it all! Ahhh a girl can dream. Here are some dreamy McQueen clutches you can find at Farfetch. 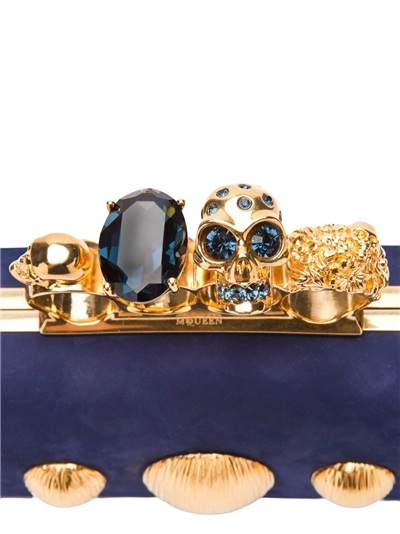 This is my favorite clutch from the Alexander McQueen collection you can find on FF. Click on the photo for more details. This is another one of my favorite stud knuckle clutches on FF. This one has a regal and royal feel to it. This one is fit for a queen, don’t you think? 😉 Click on the photo for more details. This is the whipstitch skull clutch. I like this one too even though it doesn’t have the stud knuckles. I also love that the stitching kinda resembles the british flag. Click on the photo for more details. Last but certainly not least, this is a more simple but awesome leather McQueen clutch. I’d wear the hell out of this one because I wear leather so much. It would be my go-to clutch for everything. Click the photo for more details. Check out more McQueen items by visiting the Farfetch shop! I love, love, love them all! these are gorgoues!! the black one is my fav. i love skulls, but i live them even more when they sparkle! I love all these! Sadly, I didn’t really know what McQueen was all about until after he passed. I didn’t know what I was missing… His vision for accessories and shoes are the stuff of my dreams.